This is a version of the first movement of the Rzewski piece with some altered tuning based some otonal and utonal scales derived from the tonality diamond to the 31 limit. I’m not happy with some of the tuning and will continue to work on some different chords. 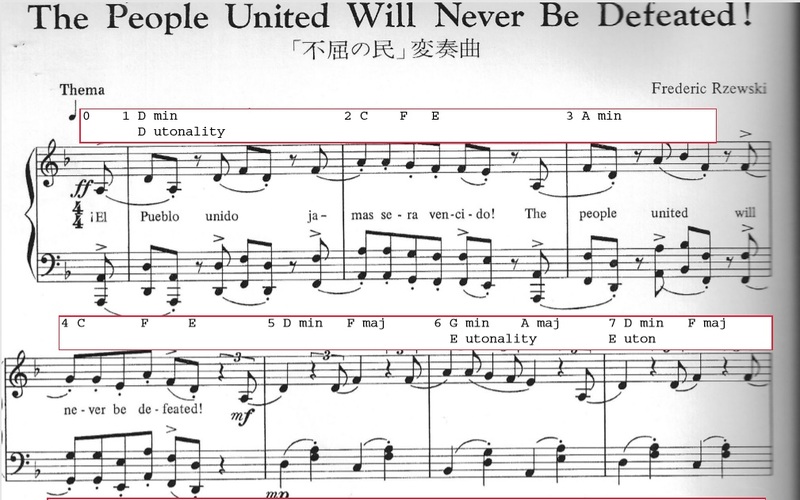 The piece is a set of 36 variations for virtuoso piano on the Chilean song “¡El pueblo unido jamás será vencido!” by Sergio Ortega and Quilapayún, which was popular in the 60’s and 70’s in Chile. Rzewski wrote his variations in 1975 as a protest against the repressive regime of Augusto Pinochet. Some say the U.S. had a major role in the coup that lead to Pinochet’s rule, which lasted from the 70’s into the 90’s. The first movement is just a statement of the theme. I like the romantic harmonies, which sound ironic in a protest song. I hope to take the tuning into interesting areas as I continue to learn the piece.